As a small boy in the 50's, at Christmas I used to look over this area from my bedroom and fall asleep in wonderment at the Christmas Tree at the top of the mast of a Blue Star line Ship. I think it was from Australia or New Zealand...Salad days. 1947. Seaman's hospital for tropical diseases. Swing Bridge. If you got stuck buy this we said "We caught a Bridger" ( late for work or home for lunch ) there was a small boat that sometimes took workers across. 1947. Before the war there used to be Stables at this end of the Street. Two of the families living here were the Blake's and the Knight's. The Blake's were my Grandparents were living at No. 37 and the Knight's living opposite married into them. 1950's This was British Road services ( BRS ) and used an unusual 3 wheeled lorry know as a Camel pulling a trailer! Livery: Maroon over Cream. 1947. 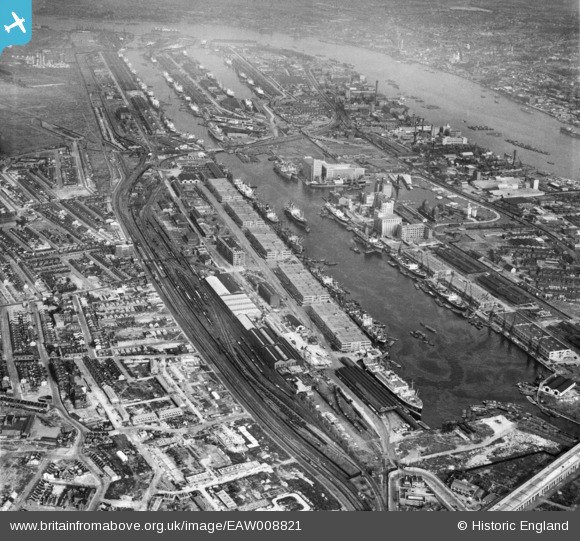 Victoria Dock Road, Known locally as you went towards Tidal Basin as " The Marsh "
1947. The Flying Angel...Seaman's Mission. It had a large golden Galleon weather vain on the roof. ( I now wonder if perhaps the Galleon was called "The Flying Angel.) This is a Anglican Church Mission society operating in over 200 ports around the world giving rest and support to seafarers. 1947. Footbridge serving Custom House Station with as you can see a access footbridge directly into the Docks. 1947. Ben's the Barbers. Something for the weekend, Sir!? Often I've sat on a plank placed across the arms of the barbers chair as a kid. 1947. Freemason's Road. Showing WW2 devastation. The Excel Centre now occupies this area.